The renowned playwright and philosopher Gotthold Ephraim Lessing (1729-81) was one of the leading figures of the German Enlightenment. His philosophical writings shifted German intellectual life away from the optimistic (and frequently abstract and deductivist) rationalism of his predecessors Gottfried Wilhelm Leibniz and Christian Wolff. 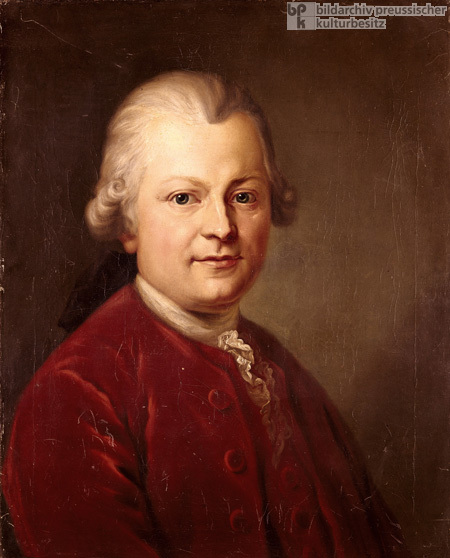 Though embedded in the Christian theological tradition, Lessing embraced Enlightenment Deism. He criticized religious prejudice and advocated freedom of thought and expression, a cosmopolitan view of humanity, and a rational, philosophical approach to religion. In his dramatic poem Nathan the Wise (1779), Lessing presented his vision of a religious truth based on justice, reason, and charity. Lessing modeled the title character on his lifelong friend Moses Mendelssohn, the preeminent German Jewish philosopher of the Enlightenment. Lessing’s plays – which include the comedy Minna von Barnhelm (1767) and the “bourgeois tragedy” Emilia Gallotti (1772) – are still part of the standard repertoire of German-speaking theater companies today. His philosophical and theatrical works exerted a major influence on Johann Wolfgang von Goethe (1749-1832), Friedrich Schiller (1759-1805), and other writers of that generation. Oil on canvas by Heinrich Lessing (1856-1911) after a painting by Anton Graff (1736-1813), 1771.